The Hanging Lake Trail is located 10 east of Glenwood Springs, Colorado on Interstate 70 in Glenwood Canyon. The trail provides access to one of the most scenic lakes in all of North America. The 1.2 mile trail climbs steeply from the Colorado River more than 1100 feet to Hanging Lake and Bridal Veil Falls. While Hanging Lake is visited by thousands of people of all ages every year some of the sections require special care to negotiate. Portions of the trail can be very slippery from water and loose rocks. The Hanging Lake Rest Area is about 1/2 mile from the trailhead. Access to the rest area is only available to east bound traffic on I70 and the exit only allows west bound travel. 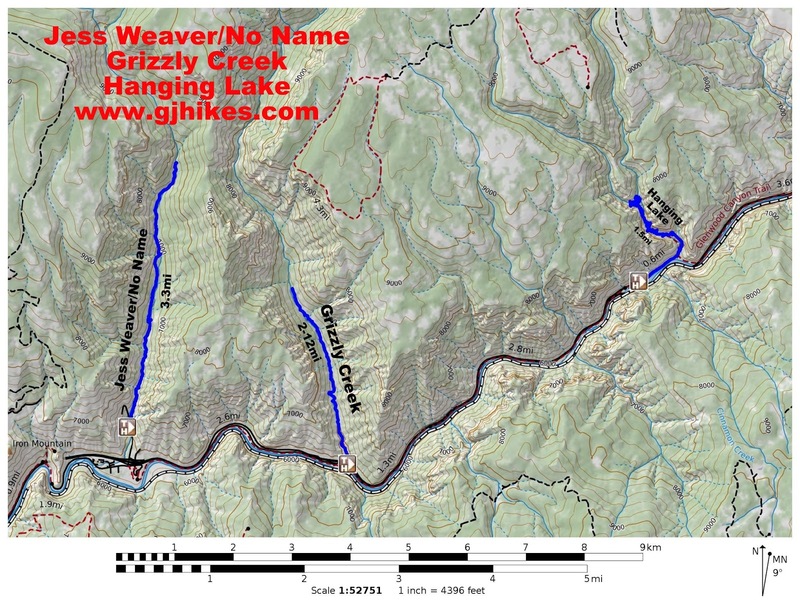 If you are coming to Hanging Lake from the east, or wish to continue east on I70 after leaving, you can drive to the Grizzly Creek rest area, a couple of miles west of Hanging Lake, to turn around. A bike path that extends the entire 12.5 mile length of Glenwood Canyon will take you along the Colorado River from the rest area to the trailhead. There is a large set of bike racks at the trailhead and several picnic tables next to the stream. 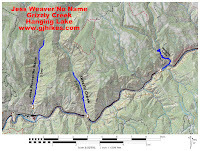 Many, many people combine a hike up to Hanging Lake with a bicycle ride along the river. After leaving the smooth and level bike path the rugged trail begins climbing steeply. The trail is well established as far as route finding goes but some sections are very rocky with an occasional protruding tree root and get a little tricky to get good footing. A sturdy pair of shoes will easily beat out a pair of flip flops. A half dozen bridges keep you dry at the places the trail crosses the stream. There are plenty of places where you can sit and relax to catch your breath and take in the beauty of the surroundings. The riparian environment provides plenty of moisture for the lush vegetation which includes ferns, choke cherries and even wild grapes. This old log shelter helps to add to the storybook feeling of the canyon. Who knows whether a troll lurks under one of the bridges or a sprite or fairy will pop out from under a log. Part of the recent renovations was to replace the old welded pipes with a new sturdy railing. This steep section of the trail climbing up the rocky cliff that leads to the lake requires you to step up several feet at a time in places. The railing comes in very handy to aid the climb and help keep you right side up. Another of the improvements is the new boardwalk and benches made from treated lumber. The boardwalk provides a place to walk without causing damage to the fragile ground around the lake. The crystal clear waters of Hanging Lake offer an unimpeded view of the travertine basin that makes up the bed of the lake. The falls that feed into the lake are aptly named Bridal Veil Falls. The water spreads out into a thin sheet as it gently spills over the mineral covered cliffs. The long fallen tree laying across the middle of the lake has been there at least 20 years that I know of. Like the other trees that have come to rest along the edges it appears that it is right where it should be. Most visitors will want to plan at least 30 minutes or more just to relax and enjoy the atmosphere around Hanging Lake. With only a little more effort you can hike another 100 yards or so to see where the water comes from that feeds into Hanging Lake. Its called Spouting Rock and every bit of water is coming right out of the mountain. As though Hanging Lake didn't provide enough for your eyes to feast upon the view back down the canyon is simply awe inspiring. The towering cliffs up to 2,000 feet high are made of a sedimentary rock called The Conglomerate of Canyon Creek. The colorful rocky cliffs provide a delightful contrast to the flora that clings to their sides. This is what the precipitous trail looks like as you start back down the mountain. I guess it's kind of a 'go slow' and 'take care' spot. I've seen people of all ages and abilities hiking the trail. I thought about labeling the difficulty as moderate but the sign at the bottom has it as strenuous so I decided to go with that. The trail does have its technical spots that require a little care. The Glenwood Springs Fire Department and Search and Rescue were carrying an apparent octogenarian gentleman down on a stretcher. I don't know what the degree of his injuries were but he seemed to be doing fine and we didn't see any blood. With the Hanging Lake trail being so easy to access, sitting close to the interstate, and being such a famous world class hiking experience it seductively draws the casual, inexperienced and sometimes even frail to venture up its path. I think it is wonderful that such an experience is an option for everyone to consider but it does occasionally catch a poor soul off guard and a rescue is needed. There is no cellphone service at all on the trail. I was able to send and receive text messages on my Blackberry from the lake. Whoever called Search and Rescue had to go back to the rest area to do so. I was carrying my SPOT and could have summoned help at most places within the canyon but there were a few places where it couldn't find a satellite. We met people from all around the country and from around the globe while we were hiking. I am curious how they all knew of the hike. There isn't a big sign along the interstate that says 'you gotta see this'. But if you would like to see it for yourself then all you have to do is take a drive to Glenwood Canyon and 'Take a hike'.